On 13 January Macron announced a three-month national debate in his letter to the people of France. — Emmanuel Macron (@EmmanuelMacron) 13 января 2019 г. ​"In France, and also in Europe and the world, people are not just extremely worried, they are deeply distressed. We must respond with clear ideas," the French president wrote. However, it is doubtful that Macron is ready to listen and meet the people's demands, according to the journalist. "One thing has to be mentioned concerning the first event where Macron conveyed Mayors to attempt: the Gilets Jaunes were kept away from the town by a substantial number of Compagnies Républicaines de Sécurité (riot police) and Gendarmes. Some were even fined 135 euros for wearing a yellow vest. Is Macron willing to listen finally and curtail his natural arrogance? It is very unlikely judging by the first town hall type meeting of this so called national debate which is once again top-down," Mercier elaborated. 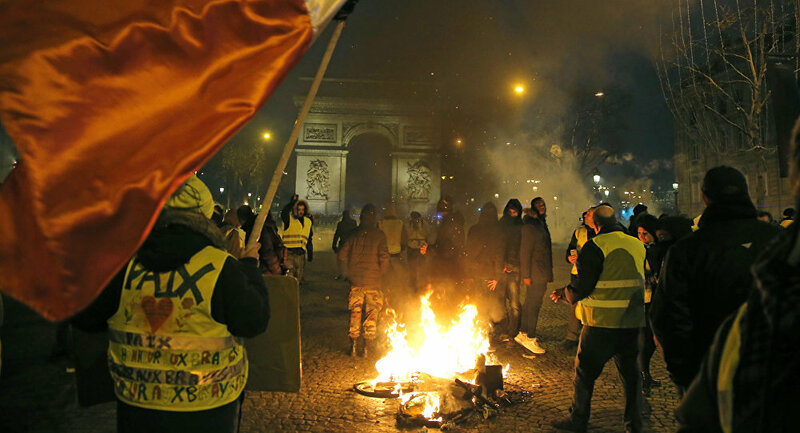 The author emphasised that "in essence, Macron's initiative of a pseudo national debate is to diffuse what his administration views as the Gilets Jaunes crisis". 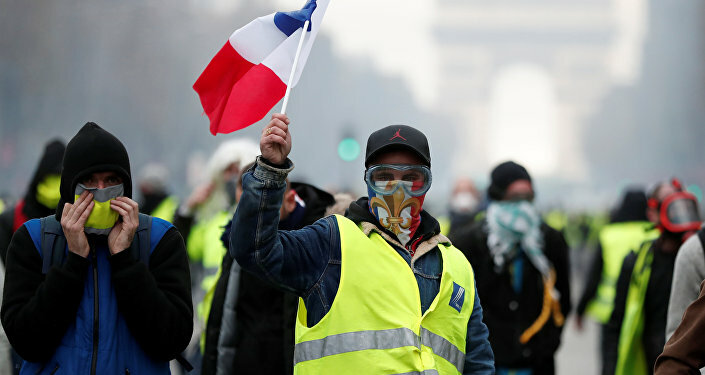 "So far, it has not worked with the Gilets Jaunes and they will be in the streets again for Act 10 this coming Saturday very likely joined by labour unions," he remarked. On 18 January, protesters took to the streets of Souillac ahead of the French president's arrival. Earlier, on 12 January almost 84,000 yellow vest protesters took to the street across France. The ninth week of the nationwide unrest saw an upsurge in the number of demonstrators, comparing with 50,000 the week before. "The Gilets Jaunes' agenda main point, beside the resignation of Macron, which is of course off the table for the French president, is the RIC or Referendum d'Intitiative Citoyenne [citizens' initiative referendum]", the journalist pointed out. The RIC is one of the main initiatives in the list of demands published in late November by the yellow vests protesters. According to it, any policy proposal gathering 700,000 signatures should be considered in a referendum. "This type of referendum, which is ground up, as I explained in my News Junkie Post article about the RIC is not something that Macron want to consider. It would likely put his job in jeopardy for one simple reason: If it was voted by the French parliament as a law, considering that Macron's approval rating is right now at around 25 per cent, he would likely be out of office within a year," Mercier explained. "Act 10 this coming Saturday will bring new elements, but judging by the large mobilisation of Act 9, it seems that Macron's repressive strategy is not working at all," the author opined. "The use of brute police force is not a way to deal with a social crisis, especially in a country like France with a rich history of revolutions". Ahead of 19 January, thousands of French locals demonstrated enthusiasm regarding the participation in the upcoming Act 10 by liking and commenting on Facebook and Twitter, according to The Local France. "It is very hard to tell what president Macron will do," Mercier said when asked to share his prognosis on the French president's next move. "Perhaps he should reflect upon what the founder of the Fifth French Republic did under the same type of predicaments. The name of this true state man, and one of France's major historical figure of recent time, is of course General de Gaulle". Referring to the social uprising of May 1968, Mercier recalled that president de Gaulle called upon a national referendum in April 1969. "He lost, by a two per cent margin, and left office the next day," the author stressed. The views and opinions expressed by the speaker and contributor are their own and do not necessarily reflect those of Sputnik.